Kimberlites are a variety of ultramafic volcanic and sub-volcanic rock and are the main source of diamonds worldwide. They occur as clusters of pipes probably along major crustal fracture zones. Common alteration minerals that can be detected by spectroscopy include biotite/phlogopite, Fe-amphibole, Fe, Mg chlorite, serpentine, calcite, saponite and nontronite. The primary indicator minerals for kimberlites are garnet, chromite, ilmenite, Cr-diopside and olivine. 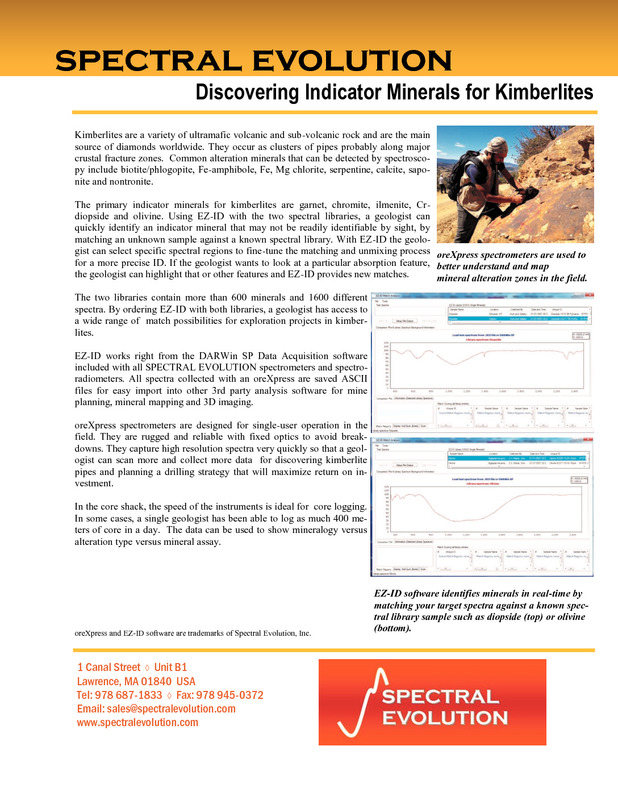 Using an oreXpress field spectrometer with EZ-ID and three spectral libraries, a geologist can quickly identify an indicator mineral that may not be readily identifiable by sight, by matching an unknown sample against a known spectral library. 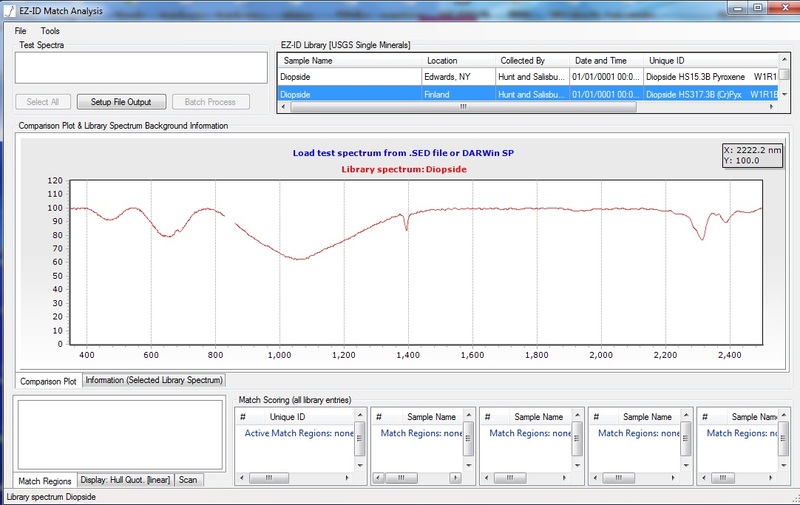 With EZ-ID the geologist can select specific spectral regions to fine-tune the matching and unmixing process for a more precise ID. 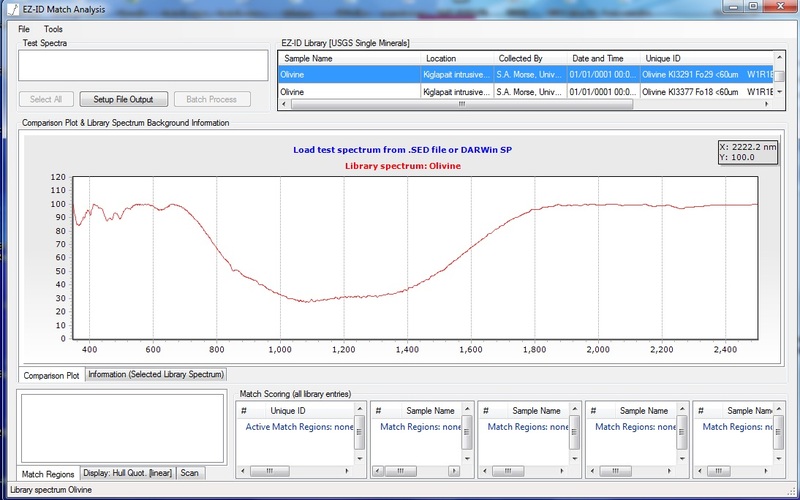 If the geologist wants to look at a particular absorption feature, the geologist can highlight that or other features and EZ-ID provides new matches. An EZ-ID library sample of diopside, an indicator mineral for kimberlites. An EZ-ID library sample of olivine, an indicator mineral for kimberlites.